The latest update of Hazel, version 3.2.3, add dynamic tag support. New features: Added "Dynamic Tags". 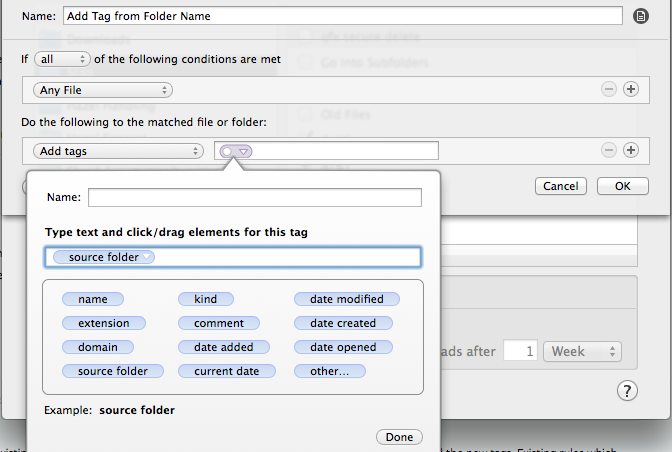 You can now create and remove tags based on a file's metadata and custom attributes. Thank you Noodlesoft! My basic filing system is now complete. See these posts for more discussion on tagging and my system. Files go into the Inbox via the downloads folder of via this script. They are evaluated and go into the Now folder or the Outbox. The Now folder is semi-organized into folders corresponding to my omnifocus tasks and some recurring items like to read items. The Outbox is watched by Hazel to autofile via tags to a shallow folder system by project. Dynamic Mavericks Tagging in Hazel!